Making gnocchi had been on my list for ages to make. 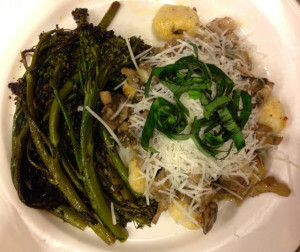 I’ve pinned and saved many gnocchi recipes and for some reason or another (normally my craving for meat or desire to quickly cook dinner), put it off. A few weeks ago, Jason and I had an amazing lunch at Lupa with our dear friend Jo who was back in New York from Toronto. Jo highly recommended Lupa, and it is one of the best Italian meals I’ve ever had, and tied with Casa Mono for the best of the Batali restaurants (even over Babbo and Del Posto). Italian is normally pretty far down my list of cuisines, but Lupa totally changed my mind on that, by having robustly flavored dishes that were still light and nicely portioned, not at all like the traditionally thought of heavy cream, large Italian dishes; therefore, we completely indulged in the menu and had several courses for lunch. (Another positive side note on Lupa: they easily accommodate gluten free and dairy free diets, just another reason to go there.) One of Jason’s dishes was a ricotta gnocchi with sausage and fennel, and the inspiration for my newest experiment. I had seen a recipe for ricotta gnocchi on A Cup of Jo and thought I could make it using fat free ricotta, cutting down the fat and calories in the dish, and finally got around to trying it. Making gnocchi does take a bit of time because of the shaping process, but it is not nearly as time consuming as I had pictured (ie: this little cute old Italian grandmother hand-making gnocchi over the course of an entire day, which becomes the centerpiece of the delicious meal she prepared for 30 of her closest relatives…I digress). In fact it only took about 20-30 minutes to mix, shape, and roll the gnocchi, and another 5-6 minutes to boil them and finally a couple of minutes to brown them, and the process is one of those therapeutic cooking experiences where I get lost in the process of making the dish and the peace of being in the kitchen without anything else on my mind but the end result of my work to be enjoyed with a French Chardonnay. 1. In a large bowl, whisk egg and egg yolk. Add ricotta, pepper, Parmesan cheese and kosher salt, and mix until well combined. 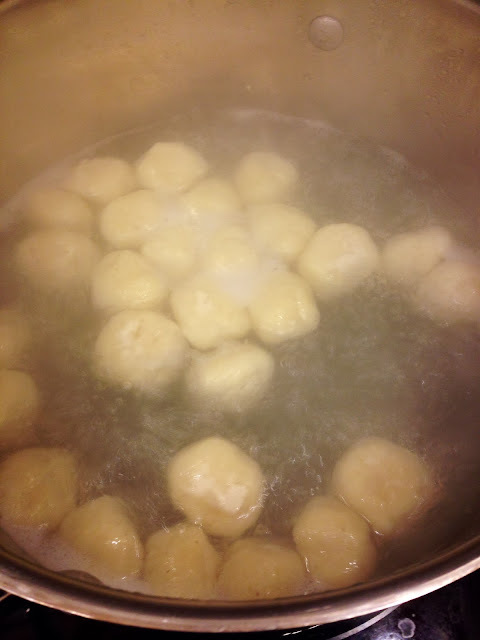 Add flour; stir just until combined and mixture forms a ball. Add more flour as necessary if the dough is too wet. 2. Dust a rimmed baking sheet generously with flour. 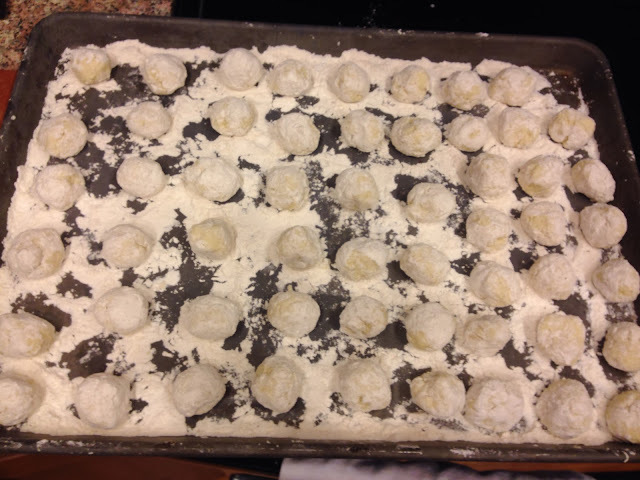 Measure out 1/2 tablespoon of dough, and roll into balls; they don’t have to be pretty (I used the 1/2 tablespoon to ensure my gnocchi were uniform in size and would cook evenly. You should end up with about 63-66 gnocchi). 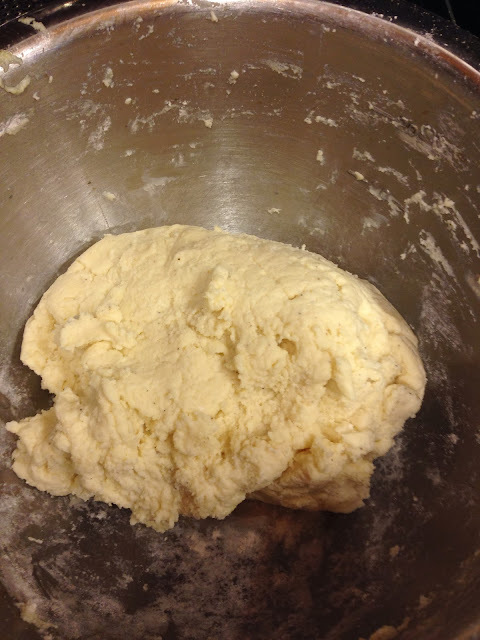 Then roll the gnocchi with more flour so that they are coated. 4. 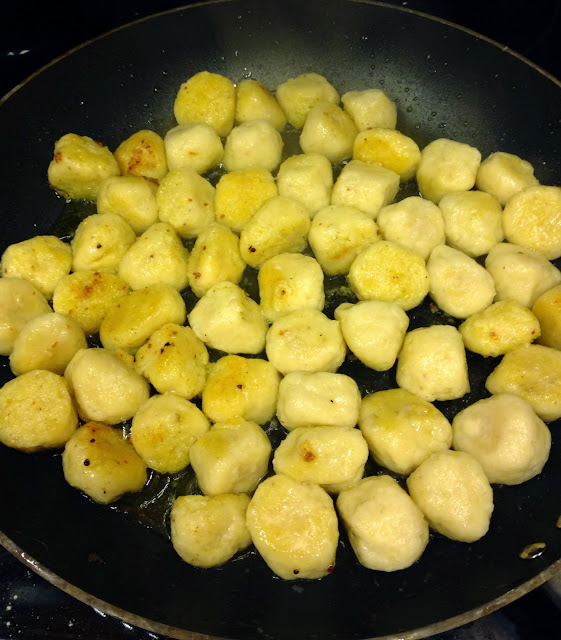 Remove the gnocchi with a slotted spoon and transfer to a plate. 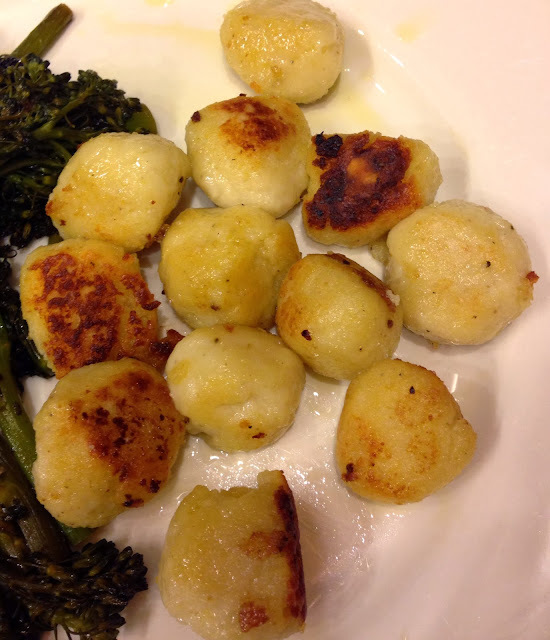 In a non-stick skillet, heat a few drizzles olive oil with some minced garlic, then add the gnocchi and gently pan fry for a few minutes on each side, until lightly browned. Add your sauce and serve with basil chiffonade. 2. In a French oven, melt the butter in the oil. 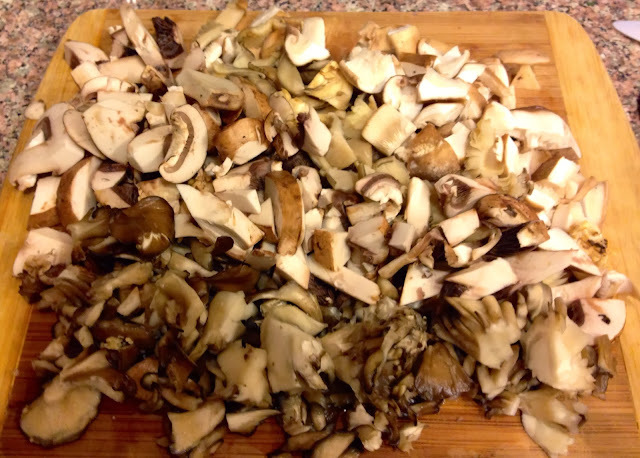 Add the mushrooms, garlic, thyme, and shallots, and season with salt and pepper. Cook over medium high heat, stirring, until tender and just browned. Stir in the wine and cook until nearly evaporated. 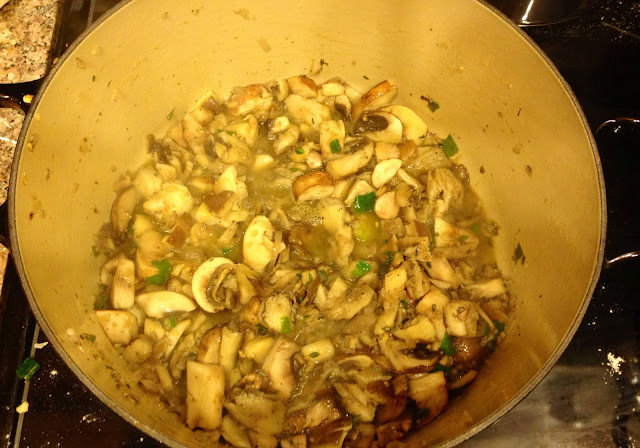 Add the chicken stock and green onions, and cook until the liquid is about 2/3 evaporate; keep warm over low heat. This fat-free ricotta gnocchi can be made mostly ahead of time and refrigerated for up to two days (leaving only the boiling and browning). I loved the balance of the delicate flavors of the gnocchi contrasted with the strong flavors of the mushroom ragu, which really took the spotlight, and the whole dish was under 500 calories per serving! However, for those of you that don’t like mushrooms (blows my mind that is possible), this gnocchi is so versatile it could stand up to tomato-based sauces or something creamy. Give this recipe a whirl when you have some time and feel like playing with your food while you make it.